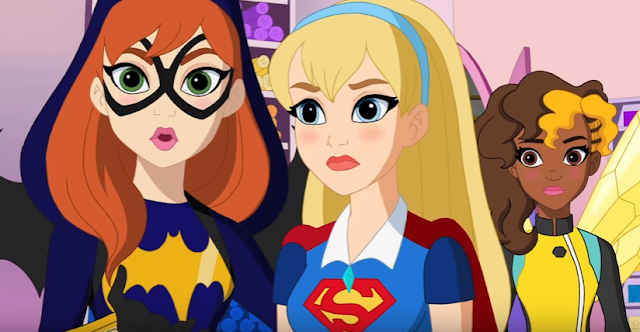 WATCH: 'DC Super Hero Girls' Trailer for First Full-Length Movie "Hero of the Year"
DC Entertainment has a hit on their hands with "DC Super Hero Girls," a multi-platform initiative to market female superheroes to girls. Famous DC Comics heroes like Wonder Woman, Supergirl, Batgirl, Harley Quinn and others have to navigate Super Hero High to become the best they can. The natural ascension from animated shorts to a toy line, costumes, books, Boomerang specials has now led to not only a second season of online shorts but its first full-length movie.Warner Bros. Home Entertainment gave CBR an exclusive first look at "DC Super Hero Girls: Hero of the Year," with the debut trailer that you can see below. The teenage titans of DC have their hands full when they must take on the baddie Eclipso. Where can you find the most powerful and prominent Super Teens in the galaxy? Super Hero High of course! Wonder Woman, Supergirl, Batgirl, Harley Quinn, Bumblebee, Poison Ivy and Katana band together to navigate the twists and turns of high school in DC Super Hero Girls: Hero of the Year. Produced by Warner Bros. Animation and DC Entertainment, the film will be distributed by Warner Bros. Home Entertainment (WBHE) this summer. These young Super Heroes discover unique abilities, develop powers, and combat an abundance of overwhelming, exciting and awkward moments to master the fundamentals of being a hero – one day at a time! Together, these seven fearless Super Heroes prove that we all have the power to make the world a better place - even while school is in session! 'DC Super Hero Girls: Hero of the Year' debuts on home DVD/Blu-ray on August 23.